Fill this dapper wooden box with awesome gifts for your groomsmen and best man. Free Personalization: We’ll print a name on the gift box (max of 8 characters) for no additional cost! 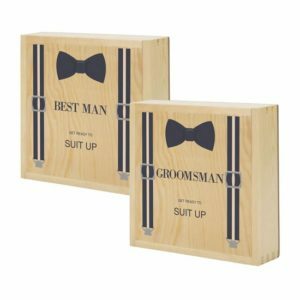 Pack your wedding party’s favorite things in a box personalized for them with our Personalized Bow Tie Wooden Groomsman Gift Box! This wooden gift box features a clever sliding lid, which can reveal anything from a flask filled with his favorite whiskey to a set of personalized cufflinks. Make your gifts to each of your groomsmen stand out, and ensure the contents of each box are as special as those guys in your wedding party. Constructed from pine wood and easily wiped clean with a soft cloth, this gift box is a fantastic addition to your groomsmen gifts. We will also print the top with a custom line amidst a dapper suspender and bowtie design at no additional cost! 9.5" L x 9.5" W x 4" H.
How do I properly care for the box? You can gently wipe the box clean with a damp cloth. Is the shredded paper included? The shredded paper is not included. You can purchase this locally at a craft or department store.